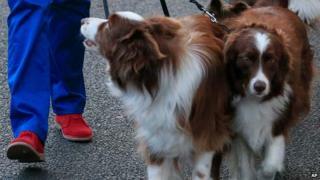 Ofcom is to investigate whether viewers were duped into voting for a stunt dog in the final of Britain's Got Talent. The broadcasting watchdog received 1,150 complaints after trainer Jules O'Dwyer used a second dog to perform a tightrope walk because her Border Collie, Matisse, was afraid of heights. ITV boss Peter Fincham later admitted the programme should have made it clear that a different dog was used. O'Dwyer and Matisse narrowly won the final, which was seen by 13m people. The doggy duo received 22.6% of the votes cast, just ahead of magician Jamie Raven, who drew 20.4%. A total of 4.5m votes were cast via the Britiain's Got Talent app for free and by landline or mobile at 50p per vote. "We've opened an investigation to determine whether viewers of ITV's Britain's Got Talent final, who may have paid money to vote, were misled about the competition," an Ofcom spokesman said. Judge Simon Cowell told the Daily Mirror he "felt like a bit of an idiot" when he found out a duplicate dog, called Chase, had performed the tightrope trick. "The moment I found out I literally put my head in my hands," he said. "The producers are absolutely gutted. I was so depressed for the show." The show's producers said: "We are sorry if this was not made clearer to the judges and the viewers at home during their final performance." O'Dwyer said she was "shocked and surprised" at the reaction adding, "I was disappointed when people said I allegedly hid Chase and I was trying to make it like Chase was Matisse. That's not so." As well as a £250,000 prize, O'Dwyer won a spot performing on the Royal Variety Performance. Speaking at the Voice of the Listener and Viewer's spring conference, ITV director Peter Fincham explained: "In the semi-final it was made quite clear the other dog played a role in it,"
"In hindsight, in the final it would have been better if that was clear." Ofcom has decided not to investigate several other complaints about Britain's Got Talent's acts, including concerns about animal welfare and dangerous behaviour.